So Co Cycle is a passion project for owner, Kara Pereira. 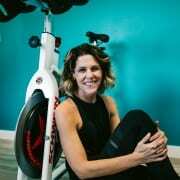 Kara began teaching cycling classes in the early ‘90s. Kara saw a need and wanted to share this popular workout with the South County community. Building community is the heart of So Co Cycle. We want each client to feel motivated during each ride and accomplished after each ride. Our certified instructors, Fitmetrix technology and fun playlists are a big part of helping you reach your fitness goals. Another big part is that feeling of community. It is so nice to have a friend greet you with a great big smile as you sit down on the bike next to them or giving you a high–five after class. We encourage great big smiles and high-fives! Our mantra at So Co Cycle is to SHINE, GIVE AND LOVE. We will help you to SHINE. You GIVE what you can and we will all spread the LOVE. Our studio uses Fitmetrix technology that offers real-time performance data to each client. It is a great motivator to see your name on a leader board displaying your workout effort points BUT if this is not your thing, you can opt out of with the click of a button. This is your workout.